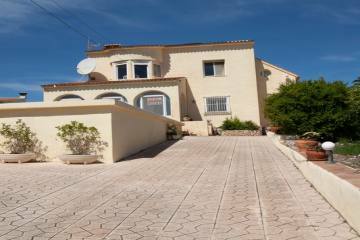 Bright refurbished Villa for Sale on one level located in Pinosol, a popular area of Javea. The Villa consists of three double bedrooms with fitted wardrobes. Master bedroom with an en-suite plus a family bathroom. Living/dining area with a fireplace and access to a double glazed covered terrace (Naya), fully fitted kitchen with a separate utility room. The outside area has a private Mediterranean garden and an 8x4 m private pool with Roman steps and terrace. The property has double glazing throughout, gas central heating, hot and cold airconditioning, Securitas alarm system, ADSL and telephone. Only a short drive to the Arenal beach.